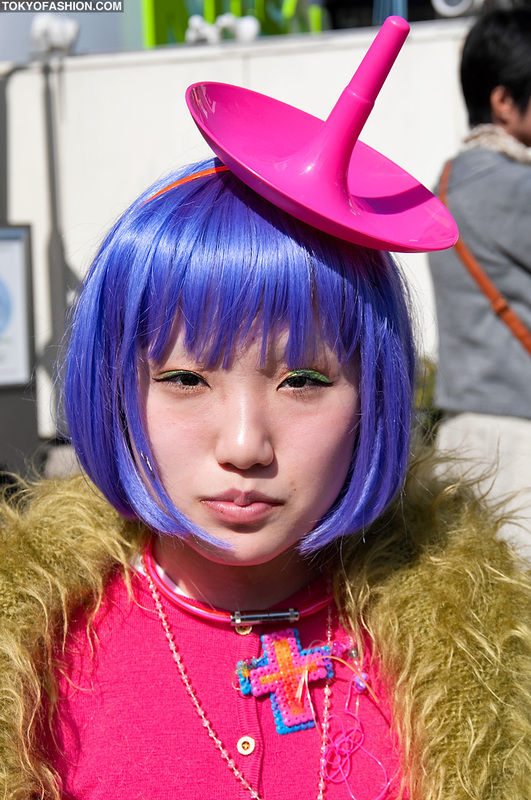 Piro and Mitake are two fashionable 17-year-old Japanese students that we photographed in Harajuku. They both told us that they shop at vintage and resale stores in Tokyo. 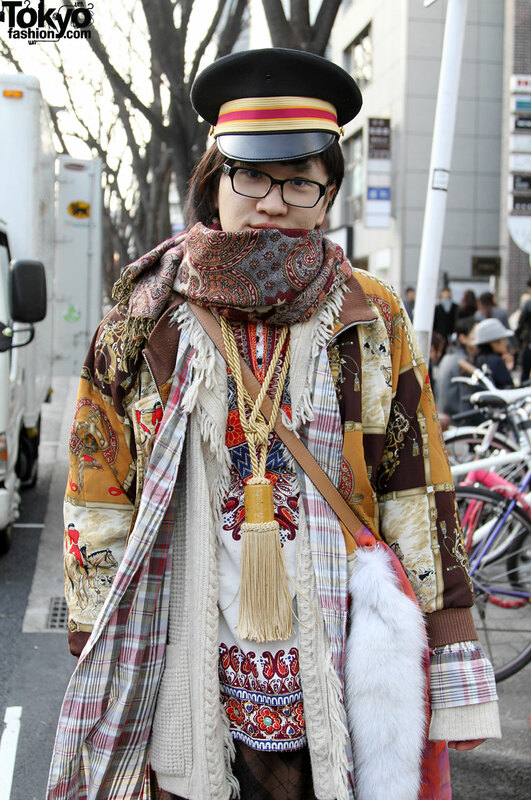 On the left is Piro, who is wearing many layers of shirts and scarves from the Kinji vintage store in Harajuku. His white shoes are from Thank You Mart and his accessories are from Tarock. 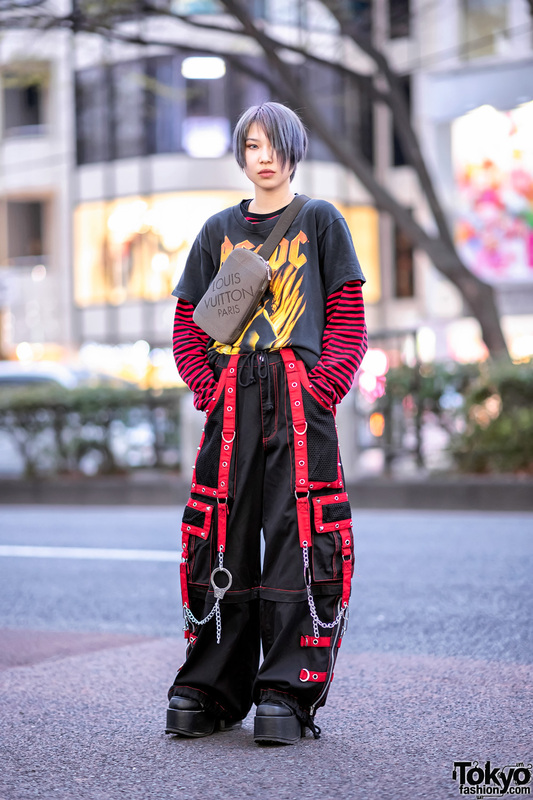 He tops off the outfit with a cool military-style hat and one of the tassel necklaces that we often see around Harajuku. It seems like there were less tassels during the winter – but now that Spring is here, we’ve been seeing them again. Mitake is on the right, wearing a pink sweater from Dog under a green furry vest, and skirt from the popular G2? resale shop in Harajuku. She’s also got on pink over-the-knee socks and white Stan Smith Adidas shoes. Her accessories are from Shoujo Mitake (we think this might be her own fashion brand) and Vivienne Westwood. Purple hair and a very unique pink hat (or is that a crown?) top off her outfit. If you can read Japanese, each of the people featured in this post have their own website. Here is Mitake’s website and here is Piro’s. This cannot go unnoticed. My only regret is the somewhat sad expression of the girl. In San Francisco I would not have given this sight a second thought, perhaps, or not, an appreciative glance. But Tokyo! Thanks for posting the pix. Made my day. Liking the Hama Bead motif on the necklace – will try it! Smiling is not ‘in’ this year people! love the purple hair ! I love the Piro’s outfit especially the hat! Fashion in tokyo is so so different from U.S.
Still…nice ensamble though. VERY different.